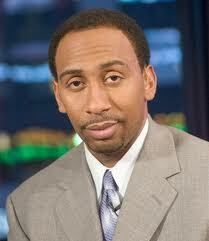 When I think Stephen A. Smith, I think of a true leader, don't you? Someone at Purdue must as the Boilermakers are hosting Smith for a keynote speech on April 13th entitled "The Road to Great Leadership." The most telling quote from the article: "Smith is a veteran sports journalist whose career has allowed him to get to know leaders up close." So that's all it takes nowadays to speak about leadership: you know some people that are leaders. Nice. Act fast, tickets are only $5. Maybe you can enjoy some cheese doodles while he pontificates. I think I would rather hear Scott Van Pelt imitate Stephen A. Smith for an hour. All time favorite impression "The New York Knicks are terr-uh-bull!" So apparently I still have friends who didn't realize this post was sarcastically calling SAS a "leader." Now they think I'm in love with the guy.